April 2019 - Professional Office Services Of Broward Inc.
As the public grows more supportive of legalizing recreational marijuana, more and more states must figure out their approach toward taxing legal cannabis sales. Ten states (Alaska, California, Colorado, Maine, Michigan, Massachusetts, Nevada, Oregon, Vermont, and Washington) and the District of Columbia have legalized the use and possession of recreational marijuana, but only eight of these jurisdictions have markets where the substance can be legally bought and sold. The map below highlights the states that have legal markets and levy taxes on recreational marijuana. Of the states with legal markets, Alaska is the only one that does not impose some form of sales tax on end-users. In each of the other states, marijuana purchasers are facing another kind of high: taxes on marijuana sales which far exceed the states’ general sales taxes. In Alaska, which has no state-level sales tax, marijuana growers pay a tax of $50 per ounce when selling the product to marijuana dispensaries or retailers. Even though customers absorb the cost of taxes paid in the form of higher prices, end-users do not pay a sales tax when purchasing marijuana. In California, cultivators pay a tax at a rate of $9.25 per ounce of marijuana flowers and $2.75 per ounce of leaves. In addition, retailers collect a 15 percent excise tax from customers on the average market price of the product. Maine legalized recreational marijuana in 2016 by ballot initiative but has not yet established a legal market. The state created an Office of Marijuana Policy this year to oversee the legislative efforts and tracking and enforcement strategies. There is no official deadline for the creation of a state market, but the director of the office said the state was on track to roll it out this year. Massachusetts officials, concerned that the state’s previous ballot initiative-approved rate of 3.75 percent was too low, raised the excise tax rate to 10.75 percent in 2017. Michigan legalized recreational marijuana use with a ballot initiative effective December 2018. The initiative laid out a 10 percent excise tax, but the state has until December 2019 to implement a legal market. Nevada imposes an excise tax on the sale of marijuana by a cultivator to a distributor. This rate is set at 15 percent of the Fair Market Value as determined by the Nevada Department of Taxation. In 2017, Nevada created a 10 percent consumer sales tax. Washington state levies a 37 percent sales tax on recreational marijuana. Vermont legalized the possession of marijuana in 2018 but did not create a legal market. D.C. also allows for possessing and growing of marijuana but does not allow for sales in a legal market. 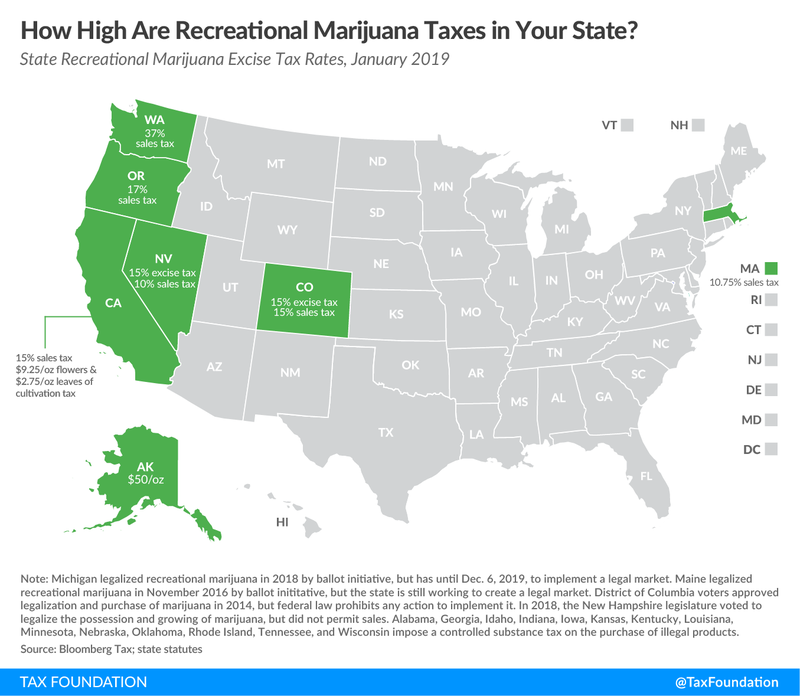 Source: Tax Policy – How High Are Taxes on Recreational Marijuana in Your State? My name is Garrett Watson, and I’m an economist and the Special Projects Manager at the Tax Foundation, the nation’s leading nonpartisan, nonprofit tax research organization that has informed smarter tax policy at the state, federal, and global levels since 1937. We have produced the Facts & Figures handbook since 1941, we calculate Tax Freedom Day each year, we produce the State Business Tax Climate Index, and we have a wealth of other data, rankings, and analysis at our website, www.TaxFoundation.org. I am pleased to submit written testimony on House Bill 3427, which provides a plan to improve Oregon’s public schools and dedicates $2 billion per biennium in additional funding for the Oregon public school system. While I take no position on this bill, I will argue that Oregon should not adopt the proposed Corporate Activity Tax, a gross receipts tax, as the funding mechanism to improve Oregon’s public schools. Gross receipts taxes, which are levied on the receipts from the sales a business makes, do not live up to the principles of sound tax policy. Taxes on gross receipts create tax pyramiding, which is when the same economic value is taxed multiple times as business inputs are taxed at each stage in the production process. This raises the effective tax rate on consumers, who will bear the burden of higher prices for goods and services. While businesses are legally required to remit the Corporate Activity Tax, the economic impact of the tax will be borne by consumers, workers, and shareholders. In addition to higher prices felt by consumers, the proposed tax will result in fewer jobs for Oregonians and lower portfolio valuations for those invested in businesses paying the tax. The key problem with gross receipts taxes is they do not exempt business-to-business transactions from the tax base. This creates tax pyramiding and incentivizes firms to integrate vertically to avoid the tax. The tax affects industries differently, more heavily impacting industries with high production volumes and low profit margins. The proposed Corporate Activity Tax would provide firms subject to the tax a 25 percent deduction for the cost of business inputs or labor compensation. This will help mitigate some of the tax pyramiding and negative economic effects of the tax but does so by creating complexity for businesses that must file and remit the tax. The experience Texas has with its Margin (Franchise) Tax is instructive. Like the proposed Corporate Activity Tax, the Margin Tax provided a deduction for the greater of a firm’s labor costs and the cost of business inputs, among other options. This created complexity for businesses operating in Texas and resulted in the tax failing to raise the anticipated revenue for the first two years of collections. Texas has since reduced its Margin Tax rates, and the state legislature expressed its intent to repeal the tax. In addition to the tax complexity, the offered deductions in House Bill 3427 do not offset the negative effects the tax will create for Oregonians. The Oregon Legislative Revenue Office (LRO) finds that prices will increase by about 0.39 percent if the Corporate Activity Tax rate is levied, which is close to the 0.40 percent increase in prices projected if the legislature adopted a gross receipts tax with no deductions permitted. There are also negligible differences in employment levels and household incomes. The results are similar because the proposed deductions narrow the tax base and reduce expected revenue, which requires a higher tax rate to raise about $2 billion per biennium. The higher tax rate mostly offsets the benefits of the available deductions. The proposed Corporate Activity Tax will harm low-income Oregonians. The proposed reductions in Oregon’s individual income tax rates will help mitigate the cost of the tax for many middle-income and upper-income households, but these tax rate reductions will not reach the least well-off in Oregon. This happens for two reasons. First, those households often have little to no state individual income tax liability to reduce. Second, while the income tax rates at the lower end of the rate schedule are being reduced, high-income filers have income in those brackets as well. Lowering rates does not actually target relief effectively. The LRO estimates that Oregonians with household incomes below about $20,500 will experience a 0.2 percent decrease in their incomes in the long run, which translates to about $85 annually. While this may be a small amount for those households with higher incomes, it could be critical for these households to make ends meet. By contrast, LRO estimates that Oregonians making above about $34,300 will experience increases in household income between 0.1 percent and 0.4 percent due to improvements in Oregon’s public school system and long-run labor force productivity. While some adjustments have been made to mitigate the regressivity of the Corporate Activity Tax, more work is needed. Ideally, the gross receipts tax would be replaced to avoid the tax pyramiding and price increases that harm low-income households, but in the interim, a refundable tax credit targeted at those with low incomes would also help these households. If the legislature wishes to raise $2 billion per biennium to support Oregon’s public education system, there are better options available to raise the revenue than via a gross receipts tax. A value-added tax can provide a stable source of revenue while avoiding the problems associated with taxing gross receipts. Economic value is taxed only once under a value-added tax, which eliminates tax pyramiding and ensures that businesses and industries are treated equally under the tax code. LRO’s preliminary modeling of a value-added tax shows that prices rise less under this tax regime than a gross receipts tax, with fewer jobs lost and slightly higher average household incomes. LRO has estimated that a value-added tax has fewer negative effects on low-income Oregonians than the proposed Corporate Activity Tax. These households may still experience lower household incomes in the long run, which suggests that a refundable tax credit may also be deployed to ensure that these households are made whole. While state-level value-added taxes are less common than gross receipts taxes, New Hampshire is a state that has successfully administered this tax and could serve as a model for designing a similar tax for Oregon. The proposed Corporate Activity Tax in the amendment to House Bill 3427 may harm low-income Oregonians while introducing complexity into Oregon’s corporate tax code. The experience other states have with gross receipts taxes shows that it is not an efficient nor a simple way to raise revenue when compared to a value-added tax. Oregon can raise the revenue needed to improve public education in the state through a value-added tax, reducing the economic harm placed on low-income households and maintaining Oregon’s competitive business tax code. Garrett Watson, “Resisting the Allure of Gross Receipts Taxes: An Assessment of Their Costs and Consequences,” Tax Foundation, Feb. 6, 2019, https://taxfoundation.org/gross-receipts-tax/. 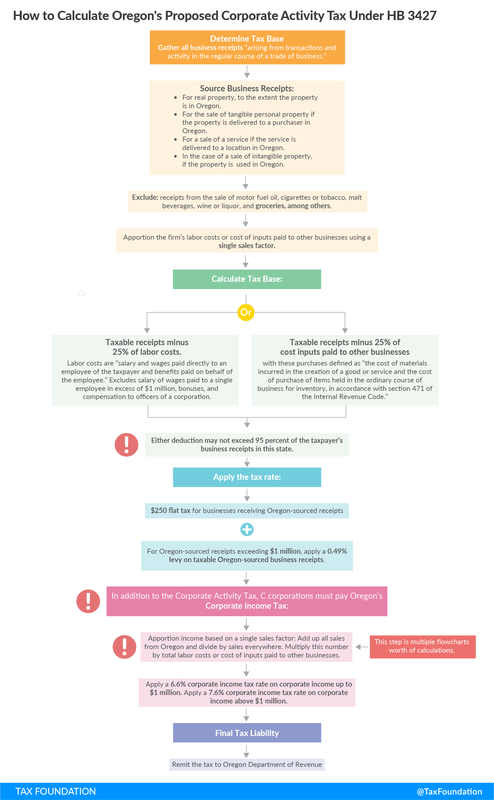 Garrett Watson and Nicole Kaeding, “Oregon Shouldn’t Adopt a Margin Tax in Its Search for Revenue,” Tax Foundation, April 8, 2019, https://taxfoundation.org/oregon-margin-tax-revenue/. Oregon Legislative Revenue Office, “Modified Commercial Activity Tax Option 1AL and 2AL,” Oregon Joint Committee on Student Success Revenue Subcommittee Meeting Document, April 8, 2019, https://olis.leg.state.or.us/liz/2019R1/Downloads/CommitteeMeetingDocument/189142. Garrett Watson, “Oregon’s Proposed Corporate Activity Tax Would Harm Low-Income Oregonians the Most,” Tax Foundation, April 19, 2019, https://taxfoundation.org/oregon-business-tax-proposal/. Garrett Watson and Nicole Kaeding, “Oregon’s Proposed Gross Receipts Tax Is More Damaging Than Proposed Value-Added Tax,” Tax Foundation, March 13, 2019, https://taxfoundation.org/oregons-gross-receipts-tax-proposal-vat//. Minnesota is running a surplus, but you wouldn’t know it given that House leaders are pushing a $1.35 billion tax increase, larger and more aggressive than the revenue-raising measures already proposed by Gov. Tim Walz (DFL). The proposal (H.F. 2125), which is advancing in the legislature, contains a laundry list of tax changes, including dramatically higher levels of business taxation, the second highest capital gains tax rate in the nation, resumption of inflation indexing for cigarette taxes, and higher state property tax rates. Minnesota has high corporate taxes, but due to the state’s single sales factor apportionment method, many large state-based corporations have minimal corporate income tax exposure. A multinational corporation based in Minnesota would only have its income taxed in proportion to the percentage of its sales made in the state—which, for a company with worldwide reach, can be very small. This is a significant factor in the state’s attractiveness to certain businesses despite high statutory tax rates, and H.F. 2125 has the potential to undermine it. Under both Gov. Walz’s proposal and H.F. 2125, the accumulated post-1986 deferred foreign income of multinational corporations would be apportioned based on the sales of all related companies, with the apportioned share taxed in Minnesota. This “deemed repatriation” would be a $361 million hit on Minnesota companies in the coming biennium, and $219 million in the following biennium. And it’s almost impossible to apportion the income in an even remotely fair way, since it’s taking income from three decades and subjecting it all to the tax system that exists now—even though the state’s tax code has changed many times in the intervening years. Both Gov. Walz and the sponsors of H.F. 2125 would also tax so-called GILTI income, though the House takes an uncommonly aggressive approach. GILTI stands for Global Intangible Low-Taxed Income, but the term is a bit of a misnomer; really, it’s a guardrail in the new “territorial” system of income taxation (which, as a general rule, only taxes income generated domestically), intended to tax high returns on foreign investment that were only subject to relatively low rates of foreign tax. The design is more complex and doesn’t always work as intended. Minnesota, however, would make it even worse. At the federal level, there’s a deduction to apply a lower effective rate to GILTI income. Minnesota wouldn’t offer it. The federal government allows a credit for much of the foreign tax paid. Minnesota would not. And, under H.F. 2125, instead of treating GILTI as foreign dividend income like most states that have chosen to tax GILTI (which provides somewhat preferential treatment), Minnesota would simply consider the foreign subsidiaries part of the larger company and tax an apportioned share of foreign income just as if it were a domestic corporation, a proposal being called “worldwide combined reporting,” which intended to raise $384 million in the next biennium alone. And whereas, at the federal level, there’s an offsetting deduction for foreign derived intangible income (FDII), Minnesota would forgo it under H.F. 2125—closing the door on an offset worth more than $100 million. Meanwhile, the state would conform to the federal government’s new limitations on the net interest deduction, but require an 80 percent add-back of the accelerated expensing provisions in the federal law, which is supposed to serve as an offsetting provision. All told, taxes on corporations would be about $860 million higher over the next biennium. Currently, only Massachusetts taxes capital gains income at a higher rate than it taxes ordinary income. (Connecticut is considering doing likewise.) In Minnesota, where ordinary income is already taxed at a top marginal rate of 9.85 percent, capital gains and dividend income greater than $500,000 would be taxed at a rate of 12.85 percent, lower only than California’s top rate of 13.3 percent. Curiously, the higher rate would only apply to long-term capital gains, not short-term gains, the inverse of the federal policy of taxing long-term gains at a preferential rate but short-term gains at the ordinary rate. This choice is largely one of convenience for the state—it can piggyback on the federal definition of net capital gains income, which is the net of long-term capital gains and losses less short-term capital losses—but makes very little sense from a policy standpoint. Long-term capital gains are subject to preferential rates at the federal level in acknowledgment of the fact that they represent double taxation, as a tax on capital income after the corporate and individual income tax, and that gains are not adjusted for inflation, meaning that a significant portion of the taxable gain may not represent any gain at all. Minnesota would throw all this out the window, actually penalizing long-term investment by the state’s highest earners (and thus most mobile residents). As we recently noted regarding the Connecticut proposal, singling out capital gains for an additional tax also doubles down on an extremely volatile source of revenue. Capital gains are already responsible for a significant share of forecasting error in individual income taxes. A task force co-chaired by former Federal Reserve Board Chairman Paul Volker and former New York Lt. Governor Richard Ravitch (D) found that “capital gains are the most erratic [tax base component] as they depend not only on stock market performance but also on taxpayers’ choices about whether and when to sell assets,” noting that during the Great Recession, overall adjusted gross income in New York (including income from capital assets) fell 18 percent, but capital gains subject to income fell a full 75 percent. Nationally, the realization of capital gains slid 71 percent between 2007 and 2009; 55 percent just in 1987; and 46 percent in 2001. Massachusetts, the only state with a surtax on capital gains income (and then only on short-term gains), has sought to insulate itself from some of the volatility by prohibiting any budget from relying on more than $1 billion in capital gains revenue, dedicating anything in excess of that amount to the state’s Rainy Day Fund. The state projects about $381 million in revenue over the biennium from a capital gains tax hike, but that estimate comes with an enormous margin of error, with revenues swinging wildly over the years. In addition to the aforementioned changes, the bill would also freeze the estate tax threshold at $2.7 million, instead of allowing it to rise to $3 million; reinstate inflation indexing of the cigarette tax; and increase the (highly unusual) state property tax levy by $55 million in the coming biennium and $176 million in the one after that. Most states only have local property taxes, and only twelve states still impose an estate tax, particularly given the evidence that estate taxes encourage inefficient tax planning and the outmigration of high-net-worth elderly individuals, many of whom would have otherwise paid state taxes for several more years at least. All told, H.F. 2125 represents a $1.35 billion tax increase over the biennium, including $860 million in new taxes on corporations and $249 million on pass-through businesses (rising to $506 million in the subsequent biennium). Minnesota’s businesses already experience fairly high levels of taxation, but single sales factor apportionment has shielded many of them from its worst effects to date. Under H.F. 2125, businesses and individuals alike would experience significant, economically harmful tax hikes—all at a time when the state is running a surplus. Governor Ned Lamont (D) is sounding a skeptical note, but in Connecticut’s legislature, a capital gains surtax proposal may be gaining steam. Under the proposal, capital gains—both short- and long-term—for filers subject to the state’s current top rate (6.99 percent) would be subject to an additional 2 percent on the income tax, yielding a capital gains tax rate of 8.99 percent. If adopted, it would make Connecticut only the second state to adopt a higher rate on short-term capital gains than on ordinary income, and the only state to impose a higher rate on long-term capital gains (though under a recent proposal, Minnesota would do likewise). At 8.99 percent, Connecticut would have the sixth-highest top rate on long-term capital gains and the fifth-highest rate on short-term capital gains in the country, which could pose problems for a state already struggling with an outmigration of high earners. Concerns grow when you consider that Connecticut has the third-most hedge fund managers in the country, after New York and California, and the second largest pool of assets under management ($390 billion). Thirteen percent of all hedge fund assets are in Connecticut, even though the state only accounts for 1 percent of the nation’s population. The state is home to many wealthy individuals with significant capital gains income—and they’re highly mobile, already paying a lot. Connecticut’s proposed higher tax on capital gains income would be the opposite of federal treatment, where capital gains receive a preferential rate. This is even more significant a difference when it is recognized that, even with a lower federal rate on long-term capital gains, the tax code is biased against saving and investment. The federal government is attempting to mitigate that bias with preferential rates; Connecticut would exacerbate it. Capital gains taxes represent an additional layer of tax on capital income after the corporate and individual income tax; any tax on them is double taxation. Moreover, gains are not adjusted for inflation, so investors are often taxed on phantom gains. This is bad for investors—a group that includes worker pension and retirement fund holders—and for entrepreneurs alike, the former because it cuts into gains, the latter because it reduces return on investment and skews what sort of investments are made. Singling out capital gains for an additional tax also doubles down on an extremely volatile source of revenue. Capital gains are already responsible for a significant share of forecasting error in individual income taxes. A task force co-chaired by former Federal Reserve Board Chairman Paul Volker and former New York Lt. Governor Richard Ravitch (D) found that “capital gains are the most erratic [tax base component] as they depend not only on stock market performance but also on taxpayers’ choices about whether and when to sell assets,” noting that during the Great Recession, overall adjusted gross income in New York (including income from capital assets) fell 18 percent, but capital gains subject to income fell a full 75 percent. Nationally, the realization of capital gains slid 71 percent between 2007 and 2009; 55 percent just in 1987; and 46 percent in 2001. Massachusetts, the only state with a surtax on capital gains income (and then only on short-term gains), has sought to insulate itself from some of the volatility by prohibiting any budget from relying on more than $1 billion in capital gains revenue, dedicating anything in excess of that amount to the state’s Rainy Day Fund. Gov. Lamont, responding to the proposal, said, “I’ve been pretty strict on not raising tax rates. Everybody comes in and goes, ‘C’mon, Gov, it’s just a half a point. It’s just another point. It’s not that big a deal.’ But it’s the fourth time in 12 years or something like that.” He’s right—and lawmakers would do well to keep any such proposal out of the state budget. Businesses in America broadly fall into two categories: C corporations, which pay the corporate income tax, and pass throughs—such as partnerships, S corporations, LLCs, and sole proprietorships—which “pass” their income “through” to their owner’s income tax returns and pay the ordinary individual income tax. Understanding the composition and characteristics of American businesses provides important context for tax policy debates. Pass-through businesses are the dominant business type, and their number has steadily increased relative to C corporations over the past 30 years. In 1980, there were 2.1 million C corporations. There were 2.6 million C corporations by 1986, but the number dropped to 1.6 million by 2013. The number of sole proprietorships, however, increased from about 9 million in 1980 to more than 24 million in 2013, while the number of S corporations and partnerships combined increased from 2 million to almost 8 million. In total, there were just under 32 million pass-through businesses in 2013, almost 20 times the number of C corporations. One explanation for this growth in pass-through businesses is that the U.S. tax code taxes C corporations more heavily than pass-through businesses. C corporations are taxed twice: once at the entity level by the corporate income tax and once at the shareholder level when profits are distributed as dividends or stockholders realize capital gains. Pass-through businesses, however, are taxed only once, under the individual income tax, meaning they are not subject to any business level tax. Following the 1986 federal tax reform, which dramatically cut individual income tax rates, pass throughs became much more attractive. 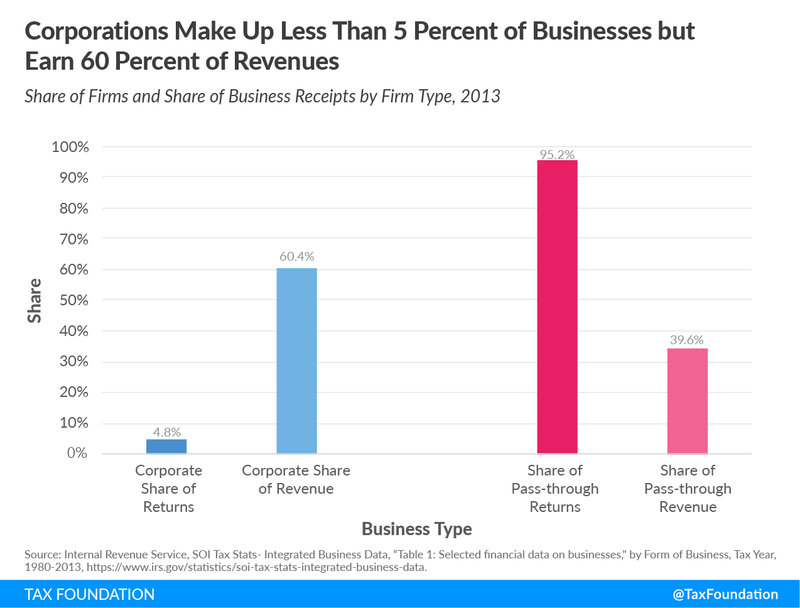 Despite this heavier tax burden, as well as being far fewer in number compared to pass-through businesses, corporations still generate more business revenue. 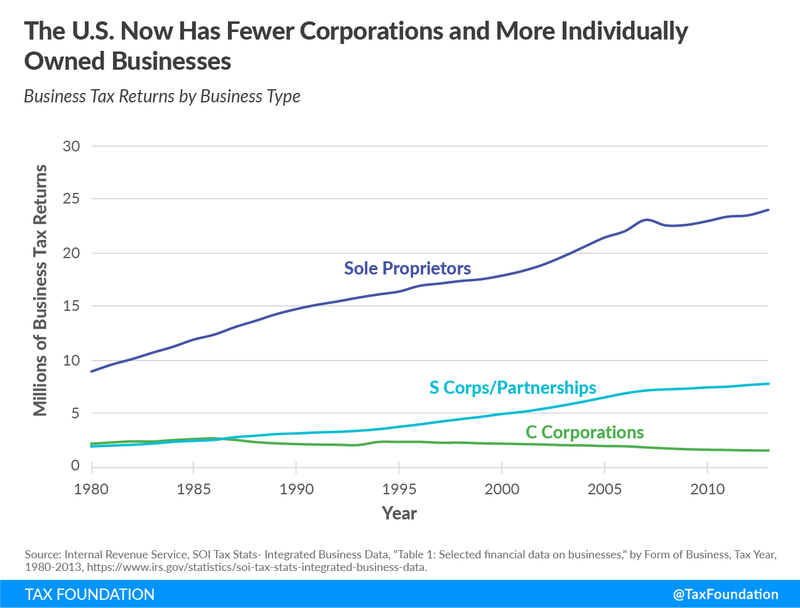 In 2013, C corporations accounted for fewer than 5 percent of all business tax returns but generated more than 60 percent of all business revenue. Pass throughs accounted for more than 95 percent of all returns, but less than 40 percent of all business revenue. Though corporations earn the largest share of business revenues, pass-through businesses outpace corporations when it comes to net income. 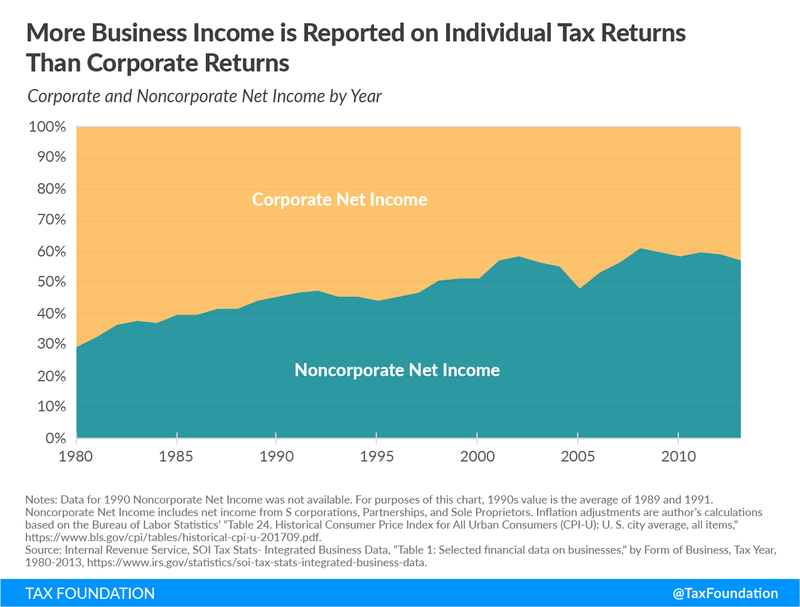 Noncorporate net income has outpaced corporate consistently since 1997, apart from a brief period in the mid-2000s when corporate net income spiked at the top of a business cycle. In 2013, pass-through businesses accounted for 57 percent of net business income, compared to 43 percent for C corporations. Both pass-through businesses and C corporations provide important contributions to the American economy. While C corporations may be fewer in number than pass throughs, they generate larger amounts of revenue and net-income per entity. On the other hand, pass-through businesses make up almost three-fifths of net business income. Policymakers who wish to change business tax policy should note the differences between pass-through businesses and C corporations as both types of businesses are crucial to the future economic success of the United States.